Everything was pretty outstanding !! The location was perfect close to some restaurants and clubs !! Excellent value! The unit was very spacious and comfortable. Nice pools. Friendly staff. Great location and easy to find from the airport. The front desk staff were helpful with planning excursions. The room was very large. Very homely, beds were very comfortable so was the couch. Facilities right their to use. A spacious apartment and staff were so friendly. Room size was great! Full size kitchen. 2 full bathrooms. Nice courtyard. Never had an issue finding a spot to relax by the pool. Close enough to walk to the beach. Mango Lagoon 2 bedroom apartment is quite spacious. Overall very comfortable for 4 people. Quite clean and is a short walk to the beach. Rate is acceptable. Lock in a great price for Mango Lagoon Resort & Wellness Spa – rated 8.2 by recent guests! Mango Lagoon Resort & Wellness Spa This rating is a reflection of how the property compares to the industry standard when it comes to price, facilities and services available. It's based on a self-evaluation by the property. Use this rating to help choose your stay! 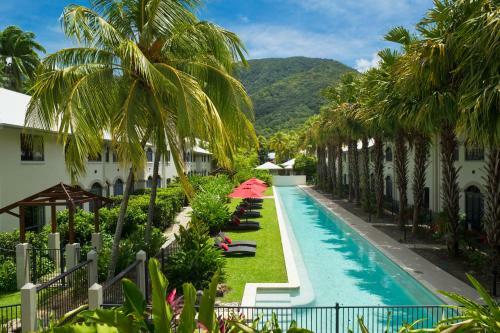 One of our top picks in Palm Cove.Guests at Mango Lagoon Resort & Wellness Spa have access to 4 swimming pools and a luxury day spa. 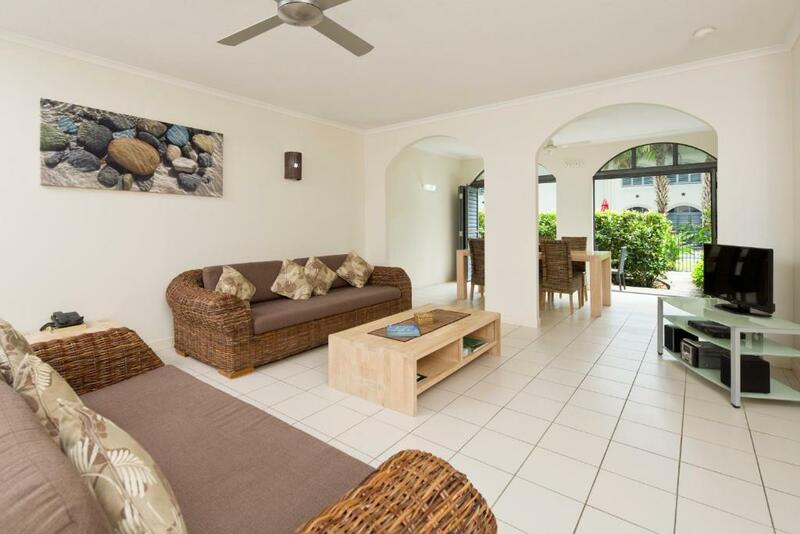 These spacious, modern rooms and suites are just a 5-minute walk from Palm Cove Beach. Guests have access to free WiFi in all rooms and throughout the resort. Free on-site parking is included. 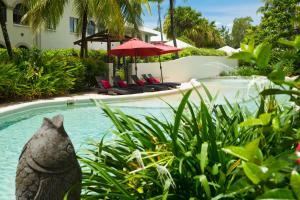 Mango Lagoon Resort Palm Cove offers accommodations with air-conditioning and a private bathroom. Ground floor suites feature private courtyards. Suites with separate bedrooms are equipped with gourmet kitchens, spacious separate living/dining areas, a digital flat-screen TV and a DVD player. Paid laundry service and ironing facilities are also available. Set among 2.5 acres of lush tropical gardens, facilities include a 150 feet lap pool, internet café and garden walkways. The tour desk can book trips to the Kuranda Skyrail and Kuranda Scenic Railway. Bicycle hire is available for AUD 15 per half day and AUD 20 for a full day. The restaurants and bars of the Esplanade are on a 5-minute stroll away. 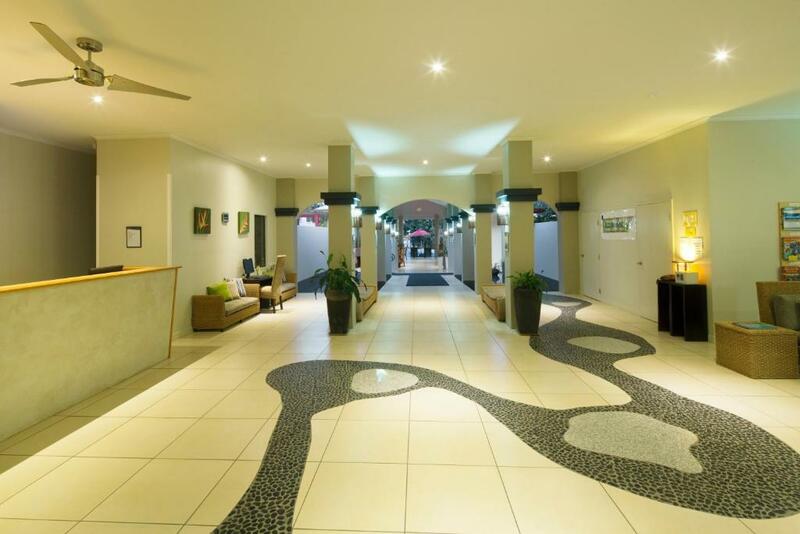 It is a 20-minute drive to Cairns International Airport. When would you like to stay at Mango Lagoon Resort & Wellness Spa? These compact rooms feature air conditioning, private bathroom and garden views. Free WiFi is available. This large, self-contained apartment features an open-plan living/dining area including a modern kitchen with a stainless steel oven, stove top and a dishwasher. It also features a flat-screen TV, DVD player, a washing machine and a tumble dryer. Free WiFi access is provided. This large, self-contained apartment features a modern kitchen with a stainless steel oven, stove top and a dishwasher. It also includes a spa bath, a washing machine and a tumble dryer. Free WiFi access is provided. This large, open plan apartment features 2 private entries, 2 bathrooms and a fully equipped kitchen with a stainless steel stove top, oven and a dishwasher. It also includes a washing machine and a tumble dryer. Free WiFi access is provided. This apartment has a microwave, dishwasher and DVD player. Free WiFi access is provided. This apartment features a sofa, dishwasher and washing machine. Free WiFi access is provided. 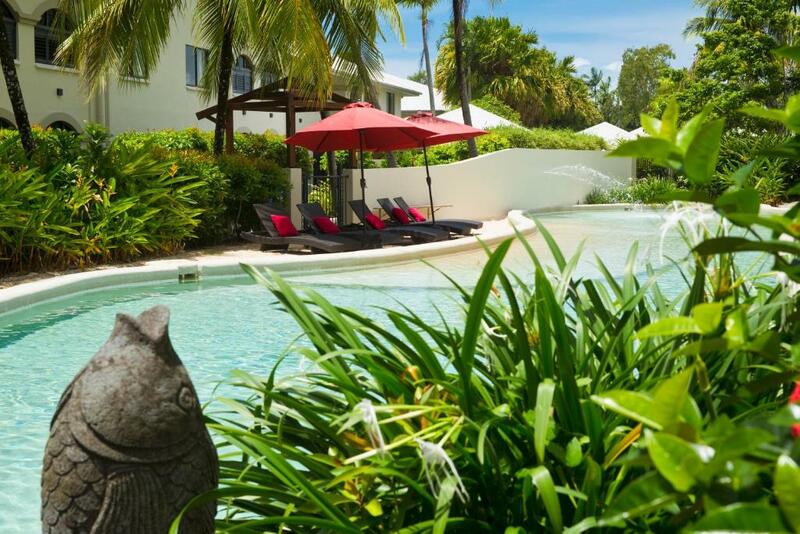 Mango Lagoon Resort Palm Cove spreads over 2.5 acres of tropically landscaped gardens with meandering walkways surrounding 4 pools for your pleasure including a 50 metre Olympic sized lap pool and child friendly pool. Our extra spacious 1 and 2 bedroom apartments are fully self-contained and we also provide the option of studio/hotel room accommodation for guests. Other on-site resort features include a covered BBQ area, sun lounges surrounding our 4 pools, on-site tour desk and NEWLY UPGRADED Free Wi-Fi access is available to all guests throughout EVERY ROOM and the RESORT. Laundry service available for a small fee. wash & dry available at reception. House Rules Mango Lagoon Resort & Wellness Spa takes special requests – add in the next step! Mango Lagoon Resort &amp; Wellness Spa accepts these cards and reserves the right to temporarily hold an amount prior to arrival. Mango Lagoon Resort & Wellness Spa accepts these cards and reserves the right to temporarily hold an amount prior to arrival. Please inform Mango Lagoon Resort & Wellness Spa of your expected arrival time in advance. You can use the Special Requests box when booking, or contact the property directly using the contact details in your confirmation. Attended wedding at Allamanda chapel, facilities at Mango Lagoon covered all our requirements very well. Easy access via rear entrance really helped. The resort was beautiful, facilities were great had 4 pools to choose from. Friendly staff highly recommend it. We paid extra for an outside terrace, however there was no shelter or lighting so we couldn’t use it when the sun was out, when it was raining or in the dark. It was a waste of money. The cutlery and crockery were dirty and needed washing before use. The markings on the dials of the cooker were worn off so we couldn’t use it because we couldn’t see the settings/temperatures. The swimming pools were awesome. The property had a very high end feel. We loved our stay here with our 2yr old. The 2 bedroom apartment with courtyard was perfect size, and right outside the pool. 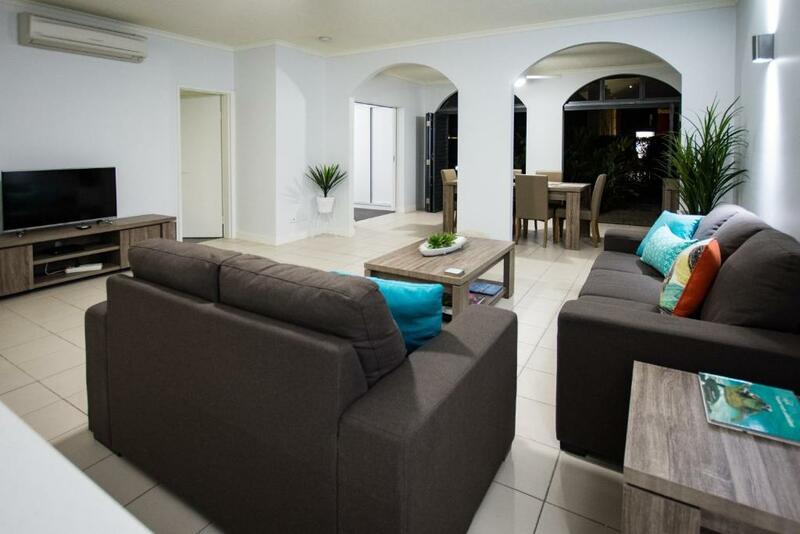 The lounge furniture was a bit dated and warn in and a few basic items in the kitchen missing but other than that we loved our stay here and would definitely choose here to say if we ever went back to Palm Cove. Coffee and milk sachets aren't replaced daily. Which I found unusual but no inconvenience. Helpful friendly staff, rooms are spacious and equipped with the necessities and very comfortable. The privacy, the lack of excess noise, the pools and the closeness to the friends who live nearby that I had come to visit. The apartment was so spacious and very well appointed. Pool area and gardens also pleasant. Was charged for pool towels and we stayed 10days there , had to remind them about cleaning our room but they did it straight away. No ice machine. The room could have done with a shower curtain around it so that the water didn’t go everywhere . All very easy things to fix and yes I would go back . Just need attention to details. 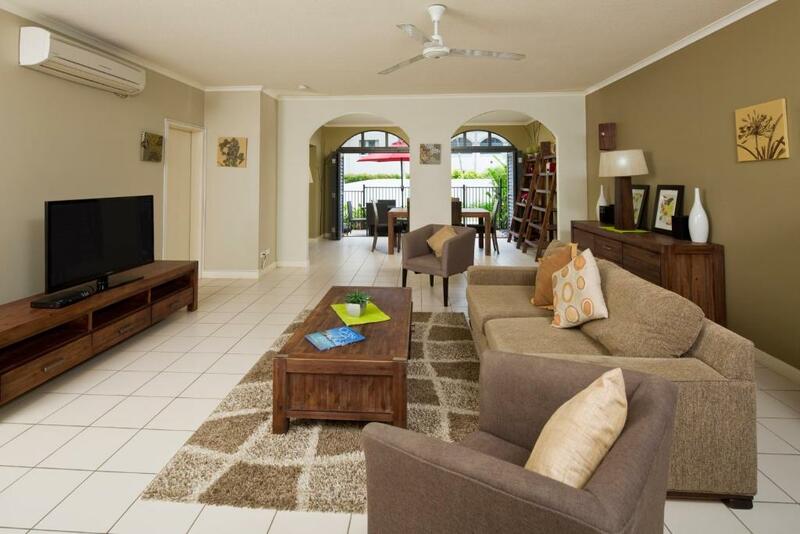 Location was good about 600m from the beach , has an amazing 50m Laps pool . Also other pools to use . The bed was the worst I have ever slept on...I was seriously considering sleeping on the floor as I thought that may have been softer. I could feel bed springs. The grounds are beautiful. Huge apartment - clean and modern. Perfect for a family. Reception staff didn't seem to know what they were doing. It was like it was their first day. The room was very dark. Lighting is terrible. The pool was still being fixed. The silence and the tropical feel. The room needed more of a clean as it was very dusty and mouldy in the main bedroom on the ceiling (health hazard). Pools needed a more regular clean but they may have just been because of the weather. Felt the massage area could be kept more clean and inviting. The beds were comfy, gardens beautiful.love Palm Cove.